Donald Trump's commission on election fraud is meeting in New Hampshire's largest city. 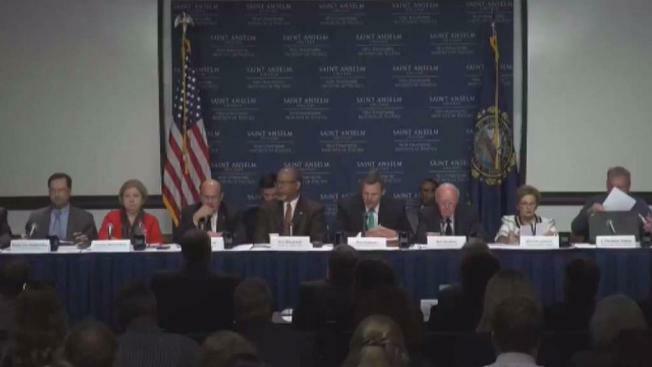 A meeting of President Donald Trump's commission on election fraud opened with New Hampshire Secretary of State Bill Gardner defending his role and the panel's existence. Gardner has faced calls to resign from the commission since its vice chairman, Republican Kansas Secretary of State Kris Kobach, alleged last week that thousands voted illegally in New Hampshire because they registered using out-of-state licenses, though state law allows college students and others to do so. As the meeting got underway Tuesday, Kobach said he will address that issue further, as will Gardner. The Democratic Gardner says New Hampshire citizens have a proud tradition of civic participation, and he isn't about to turn away from that now. Gardner says the group's ability to reach consensus is threatened by the partisan reaction it has evoked. California's secretary of state says the meeting of President Donald Trump's voter fraud commission is just the latest insult in an ongoing quest to suppress voting rights. The Presidential Advisory Commission on Election Integrity is meeting Tuesday in New Hampshire and has spurred controversy since it was established in May. Critics say the Republican president is using the commission to support his unsubstantiated claims of widespread voter fraud that cost him the popular vote during the 2016 election. Democratic California Secretary of State Alex Padilla says he's disappointed but not surprised that the panel won't hear any testimony from women or people of color. A spokesman for the commission didn't immediately respond to a request for comment. Democrat Hillary Clinton got more than 60 percent of the vote in California. Protesters holding "Vote Free or Die" signs are greeting members of President Donald Trump's commission on voter fraud in New Hampshire. The signs are a riff on New Hampshire's "Live Free or Die" motto, and protesters from the New Hampshire Campaign for Voting Rights say the commission is a sham designed to promote voter suppression. The panel is holding its second meeting Tuesday at Saint Anselm College to investigate the Republican president's unsubstantiated claims of widespread voter fraud in the 2016 elections. Joining the protesters was former Missouri Secretary of State Jason Kander, a Democrat and founder of Let America Vote. He says the commission was created to substantiate the biggest lie ever told by a sitting president and should be dismantled. A commission created by President Donald Trump to investigate his allegations of voter fraud is scheduled to meet in New Hampshire. The Presidential Advisory Commission on Election Integrity has spurred controversy since it was established in May. Critics say the Republican president is using the commission to support his unsubstantiated claims of widespread voter fraud that cost him the popular vote during the 2016 election. There have been isolated cases of voter fraud in the U.S. But there's no evidence of it being a widespread problem, as Trump suggests. The New Hampshire chapters of the American Civil Liberties Union and the NAACP say they plan to call for the commission's dismantling. Tuesday's meeting is the commission's second but its first outside Washington, D.C. The vice chairman of the commission is Republican Kris Kobach, who's Kansas' secretary of state.